Imagine you’ve been invited to be a trustee of a longstanding family foundation. You join the board meeting and nod and exchange pleasantries with the other trustees—and then you are introduced to one whose affiliation might be Bank of America or JPMorgan Chase & Co. Sometimes, however, bank trustees’ powers are more extensive—more like those of the trustee you might be—such as having a say in determinations about potential grant recipients’ qualifications for foundation dispositions, or suggesting modifications in the trust’s priorities if those priorities have become impractical or unnecessary.1 The bank trustee role is a business function built right into the operations of some foundations, but it gets scant attention among nonprofits. As a foundation trustee, however, you’11 be familiar with the latent power of the bank trustee—a power that Mary L. Smith, the widow of oilman William Wikoff Smith, discovered when the bank trustee of the W. W. Smith Charitable Trust attempted to get a large, retroactive fee increase for its role in administering the trust Smith left in support of medical research, college scholarships, food and clothing for children and the elderly, and maritime education. In this article, we look at the costs charged by a handful of large banks as trustees (not individual bankers as trustees) to private foundations that they serve—specifically, banks serving private foundations with assets of over $50 million. 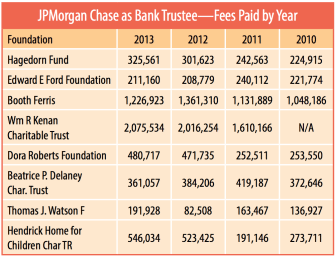 The costs are drawn from the 2014 financial information of three of the four largest banks in the United States: JPMorgan Chase, Bank of America, and Wells Fargo (the fourth, Citigroup, does not appear to hold bank trustee roles with private foundations with over $50 million in assets). 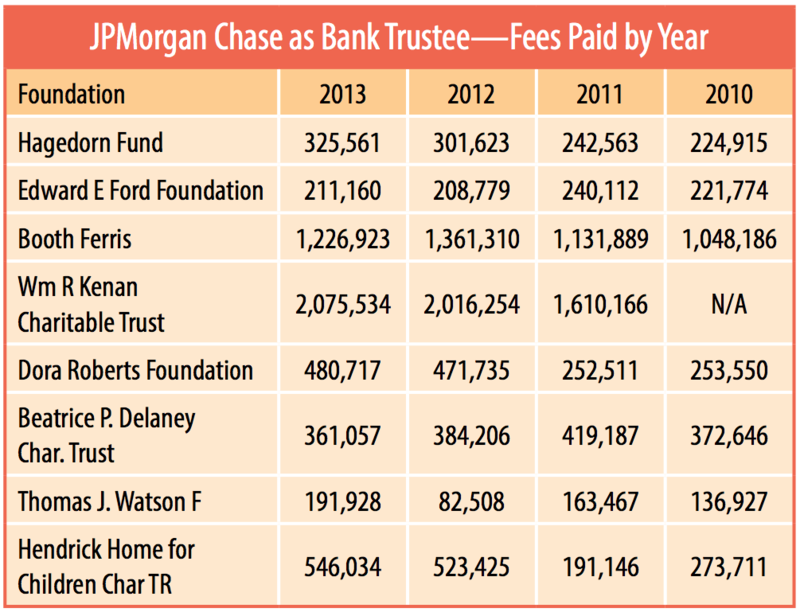 Given the mammoth size of these banks, the trustee fees earned from their services to foundations can hardly constitute a large slice of their profits. But banks are back to earning huge profits in our society, taking in just short of 30 percent of total U.S. profits, and higher profits than they were generating before the financial crisis of 2008.2 Increasingly, bank profits are dependent less on lending and more on other business activities. And while this analysis doesn’t establish exactly how profitable bank trustee roles with private foundations might be nor purports to calculate the bank trustee earnings of all banks, what it does establish is that three of the largest banks in the nation are functioning as bank trustees for dozens of foundations and earning substantial revenues for their services. For these banks—and likely for others—bank trustee roles constitute a revenue source that is largely unknown to the American public and even to most nonprofits. Not long before the national and global fiscal collapse, banks had earned themselves a troubled reputation in philanthropic circles, due to an unusual case in Philadelphia. Wachovia (now Wells Fargo) had been the bank trustee for the W. W. Smith Charitable Trust. Wachovia had inherited this fiduciary role when it acquired First Union Bank, which had been the bank trustee after it acquired CoreStates Bank, which itself had become the Smith trust’s bank trustee when it absorbed Philadelphia National Bank (PNB)—and so on during the wave of serial bank mergers and acquisitions that occurred in the 1980s, 1990s, and early 2000s.6 And that trustee wanted an increase in its annual fee—a shift in the calculation to a percentage of the trust’s total assets rather than a percentage of its annual income; in 1998, when First Union made the request, this would have more than tripled its annual fee, from $261,799 to $914,370. First Union and then Wachovia as its successor also asked that the fee be increased retroactively for the previous fifteen years, on the theory that the bank trustee had been inappropriately undercompensated ail that time. The trust’s only other trustee, Smith’s widow, didn’t agree, and the bank trustee went to court and challenged the institution it purportedly served as a fiduciary. The table reveals at a glance the extreme concentration of assets and deposits in the top four banks. For example, the total assets of the fiftieth-largest bank in the United States, FirstMerit Corp., based in Akron, Ohio, are less than one 1 percent as large as JPMorgan Chase’s. Regions Bank is the bank trustee for the Robert R. Meyer Foundation of Birmingham, Alabama, whose grant application strongly encourages applicants to join the Alabama Association of Nonprofits. As noted earlier, the role of a bank trustee is much broader than simply functioning as a vendor to a foundation for a series of discrete managerial and investment tasks. The role includes investing foundation assets, balancing spending and investment priorities, and pursuing and protecting donors’ interests and priorities. 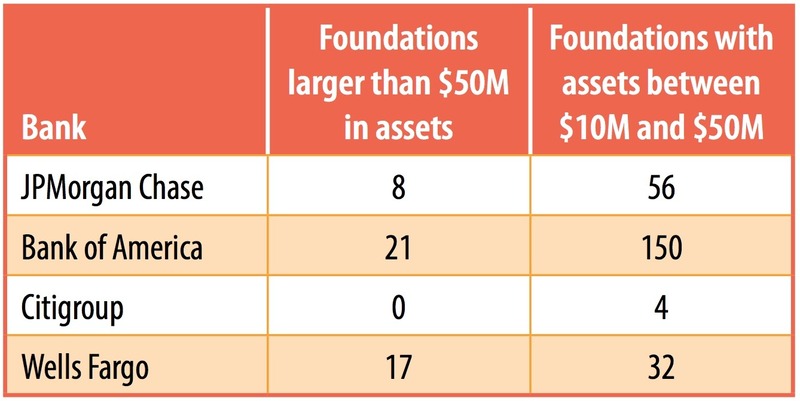 While meant to protect the charitable and philanthropic interests of donors, bank trustees can also exercise significant control over the assets of foundations. For example, a bank trustee might resist supporting movements to increase the social or mission investment of assets and instead emphasize investments for return. While a bank trustee might be able to resist conflicts of interest that individual foundation trustees could in theory succumb to—that is, individual enrichment and personal inurement—bank trustees have been challenged for selling the banks’ own products to the foundations they serve or investing foundation assets in bank equities. And, when the relationship of the founders and donors to their foundations becomes more attenuated (as at times it does), the potential latitude of the banks to exercise power grows. Most of the foundations’ 990s examined here indicate that the banks spend approximately thirty-eight to forty hours a week in their bank trustee roles. One of the least reliable data points in a 990, however, is the estimate of hours worked by trustees—individual or corporate. Whether or not the bank trustees are devoting that much time to their roles at the foundations in question, we suspect that the bank trustee function is not a charitable contribution on the part of the banks. Back in 2000, a presentation by Standish Smith of HEIRS® outlined an issue that warranted monitoring—the profitability of the bank trustee role. Smith suggested that some corporate trustees might occasionally be “tempted to blur the line between the right to control (the legal interest) and the right to enjoy (the so-called beneficial interest)” of the foundations and trusts they are charged with overseeing.16 Specifically, he identified several factors that could make the banks’ roles as trustees a little less than trustworthy at times—notably, the profitability of the function (particularly the profitability of the banks’ trust and investment departments), citing operating margins of between 30 and 45 percent. Given returns that high, bank trust departments could in many cases cut the fees they charge for their trustee functions and thereby increase the amount of money available for the trusts’ or foundations’ charitable distributions; however, with increasing competitive pressures in a consolidating market, banks might start looking at their trustee function as an arena for upping the revenue they make from private foundations as well as for building power via their control over these foundations. For the sake of argument, we can assume that in most cases bank trustees try to treat the foundations they serve fairly and then some. As small parts of the business economics of large banks, bank trustee functions shouldn’t be all that attractive an arena for profit-motivated banks to maximize their returns. However, as suggested above, this changes after a merger or acquisition, and is exacerbated by the competitive pressures the banks face following the Great Recession. A major motivation in bank mergers is to achieve efficiency through stripping the two or more united entities of redundancies, reducing unnecessary costs, and maximizing potential returns wherever they exist in the combined megabank. That includes raising what the new megabank owners might see as inadequate compensation to make the role of bank trustee more productive vis-à-vis financial return to the bank. 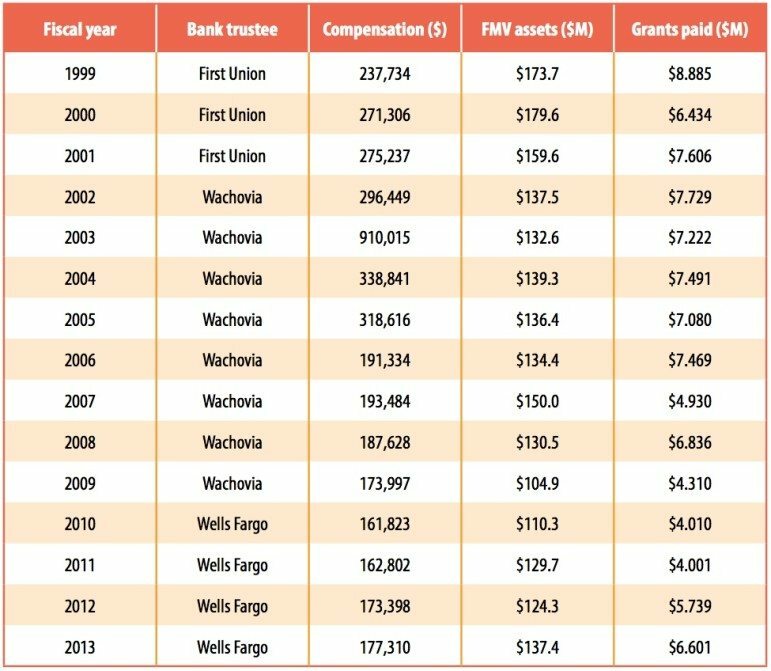 That First Union and then Wachovia would want to triple their fee as a trustee and hike fifteen years of back fees as well is, in the business models of bank mergers, understandable. Of course, a push from banks for higher trustee fees is likely to be met in some cases—when the foundations’ founders or other trustees are paying attention—with pushback by nonprofits trying to maximize philanthropic resources and minimize nonphilanthropic administrative fees. JPMorgan Chase is the product of mergers and acquisitions, including Manufacturers Hanover Corporation, Chemical Banking Corporation, First Chicago Corporation, The National Bank of Detroit (NBD), Bank One Corporation, The Chase Manhattan Corporation, and Washington Mutual Bank. Bank of America, as it stands today, is the product of a merger with NationsBank, several additional acquisitions such as FleetBoston, and, in the wake of the financial crisis, Countrywide. Wells Fargo today reflects other banking giants that were acquired by Wells or by the banks Wells acquired, such as First Fidelity Bancorp, First Union, CoreStates, Wachovia, and the troubled World Savings Bank. As the relationship between the original bank trustee and the philanthropic donor becomes attenuated by the passage of time—and, in U.S. banking, often serial bank mergers and acquisitions (which more often than not result in formerly local bank trustees moving out of state)—it should not be surprising that what was once a bank service to longstanding wealthy depositors develops into more of a business relationship between the bank trustees and the foundations they help govern. That makes the W. W. Smith case an example of a struggle over fees and services that could become more rather than less likely, as banks feel the pressures to make every possible cost center one that comes out well in the black. 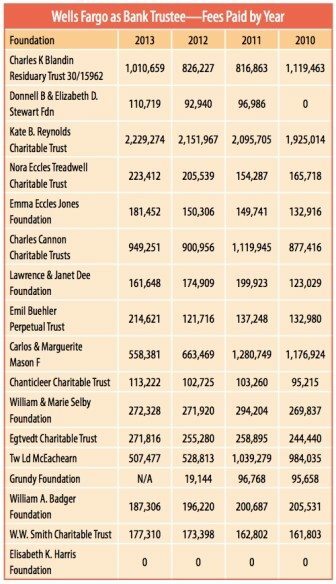 Why would a donor choose a bank as opposed to an individual to serve as the trustee of a charitable entity? Wealthy individuals or families thinking about establishing a charitable trust—that is, a philanthropic grantmaking entity—sometimes choose corporate trustees, such as the trust department of a bank, to manage their assets and ensure that the charitable purpose of the trust is maintained. Often, the choice of trustee is a bank with which the donor has a long-established relationship. Among the multiple reasons a donor would choose a bank might be: the bank’s experience in the management of trusts and estates; the bank’s experience in investment of assets for maximum returns; the reliability of an “institutional” trustee as opposed to an individual trustee (who might have personal concerns and agendas); the bank’s presumed fidelity to the donor’s charitable priorities and intent; the bank’s hoped-for neutrality and objectivity in the face of the competing interests of a donor’s various family members; and, in theory, the bank trustee’s institutional continuity as compared to individual trustees who might leave the foundation board for one reason or another. As more individuals and families generate significant asset holdings that they want to insulate from estate taxes, wealth advisors increasingly suggest that potential donors establish irrevocable charitable trusts and select corporate trustees—that is, the trust departments of banks as well as other trust administrators—to ensure their assets get used for the charitable purposes the donors want and expect while alive and after they are gone. As noted earlier, making a bank a trustee for a foundation, particularly with few other trustees to counter it, gives the bank broader powers than some observers might assume. Wolverton writes about the McCune Foundation of Pittsburgh suing its then-trustee National City Bank in Cleveland, not only for improperly overseeing the investment of foundation assets but also for refusing to allow family members a voice in the investment decisions, and for investing much of the foundation assets in the bank’s own stock. McCune lost in court (although, according to Wolverton, the foundation continued to criticize the bank publicly). As James Edwards, a member of the McCune board, told the Chronicle, bank trustees “want to act like they don’t have a conflict of interest, but any fool can see they do.” A similar challenge to Bank of America (having acquired Pacific National Bank and others) succeeded, finally, in making the case that it had overbilled trusts and foundations for some years, with a U.S. Court of Appeals judge ordering Bank of America to pay $111.5 million in punitive damages and restitution to thousands of claimants. According to the Smith trust’s former administrator Bruce Brown, William Smith had a personal relationship with G. Morris Dorrance, the former chairman of PNB, who served as the institutional cotrustee of Smith’s foundation. But with First Union and then Wachovia, the Smith trust had a bank trustee that was no longer local but based in Charlotte, North Carolina; and, as Brown noted, “Dorrance knew Bill Smith—his interests, his passions, his intentions for his charitable funds. Not one of the ‘revolving door’ representatives from North Carolina-based Wachovia knew Bill Smith.” It was a relationship of trust—the root of the concept of trustee; “no such relationship of trust exist[ed]…between Mrs. Smith and Wachovia, a banking institution foreign to the Philadelphia market.” Wachovia, in Brown’s opinion, could “take advantage of’ the law and “fatten its bottom line, but any increased fees will come out of the pockets of charitable grant recipients.” The Smith case and other cases of charities struggling with their bank trustees reflect a different/past economy—one in which the local banker in the trust department knew well the wealthy clients it served as institutional trustee for their charitable foundations. With the bank trustees serving charitable foundations, the dynamic is much the same. The relationship is likely to be impersonal, institutional, and distant. The banks’ view of the bank trustee role may in some circumstances be less about service and more about business. In much of the litigation that has emerged around bank trustee roles, donors and foundations have complained that the banks are putting their own priorities, including sometimes the banks’ own philanthropic objectives, over the philanthropic priorities of the founders, donors, and family members involved in the charitable institutions. When the bank trust department fulfills its bank trustee role with a charitable trust or private foundation, the calculus may well emphasize the bank’s economic return as much as the foundation’s charitable distributions. In the Form 990, aspects of what the bank trustee might be engaged in doing—the management of assets, investments, and capital flows—may be the least understandable, least consistent, and most opaque information presented in the IRS filings. Although speaking about the trustee reports in general—but applicable to the information in Form 990s—Standish Smith noted the problem of understanding and interpreting the banks’ reports, not only by external watchdogs but also by foundation insiders themselves: “The trust accounting statements to which I have been exposed do not always appear to be models of clarity or disclosure. That’s unfortunate, since the trustee-beneficiary relationship is, in theory, a fiducial relationship of great sensitivity, it seems beneficiaries should be entitled to statements that are timely, comprehensive, detailed and understandable.”22 Presumably, most bank trustees balance the banks’ own financial imperatives with the interests of their foundation or charitable trust clients. For those that don’t, the importance of watchdogs that monitor—and understand—Form 990 filings to track how much banks earn from their bank trustee roles and how they are investing the foundations’ moneys cannot be overstated: as Smith observed, every dollar that is paid to Bank of America, JPMorgan Chase, Citigroup, or Wells Fargo in excess of what the banks need and deserve is a dollar that could have gone to a charity instead. After years of litigation, what happened to the fees that the W. W. Smith Charitable Trust was ordered to pay its Wachovia (subsequently Wells Fargo) bank trustee? While the fees skyrocketed in fiscal year 2003 as Wachovia took advantage of the lower court ruling that increased its compensation, the fees subsequently fell in later years in response to the Pennsylvania Supreme Court ruling, as the graphic below makes clear. 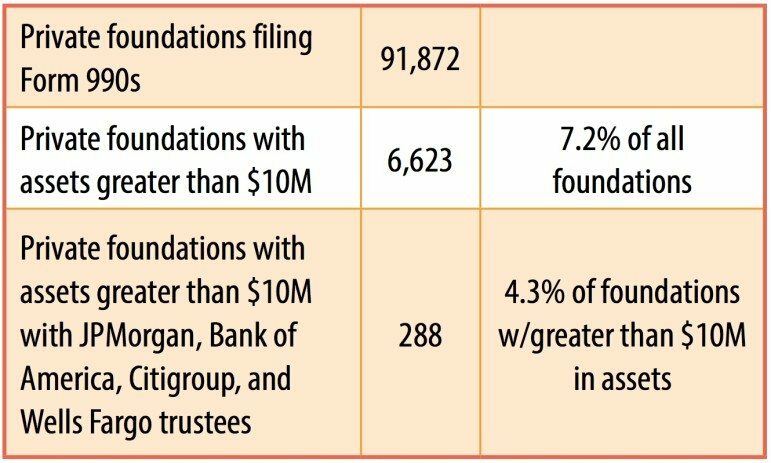 The ratio of the bank trustee fee to the foundation’s assets in 2013 is roughly back to where it was in 1999, except for the years that the Smith trust shelled out substantial legal fees, including $472,665 in 2002 and $77,379 in 2005. Basically, the bank trustee and the foundation have come full circle, minus the costs incurred in the litigation—and the mental toll it took on Mary Smith—when the friendly trust from the local Philadelphia bank that had handled the Smith family’s philanthropic interests for so many years transformed into a distant trustee, located in North Carolina and then beyond, that viewed the foundation as a revenue source rather than an entity to safeguard and protect. Ben Walsh, “No, Regulation Is Not Keeping Banks From Making Money,” Huffington Post, November 12, 2014. “25 People to Blame for the Financial Crisis: Angelo Mozilo,” Time, accessed May 4, 2015. “The origins of the financial crisis: Crash course,” Economist, September 7, 2013. Frank Newport, “Business and Industry Sector Images Continue to Improve: Images of 24 business sectors are most positive since 2003,” Gallup, September 3, 2014. Patricia Horn, “Legal fight could hurt trust’s giving: Wachovia wants a bigger fee, plus $5 million for work from the past,” Philadelphia Inquirer, January 25, 2004. Brad Wolverton, “Bank Sues Philadelphia Trust in Quest for Additional Compensation,” Chronicle of Philanthropy, April 14, 2005. Christine Ahn, Pablo Eisenberg, and Channapha Khamvongsa, Foundation Trustee Fees: Use and Abuse (Washington, D.C.: The Center for Public and Nonprofit Leadership, Georgetown Public Policy Institute, September 2003). Constantine Von Hoffman, “Number of U.S. banks drops to record low,” Moneywatch, CBS News, December 4, 2013. 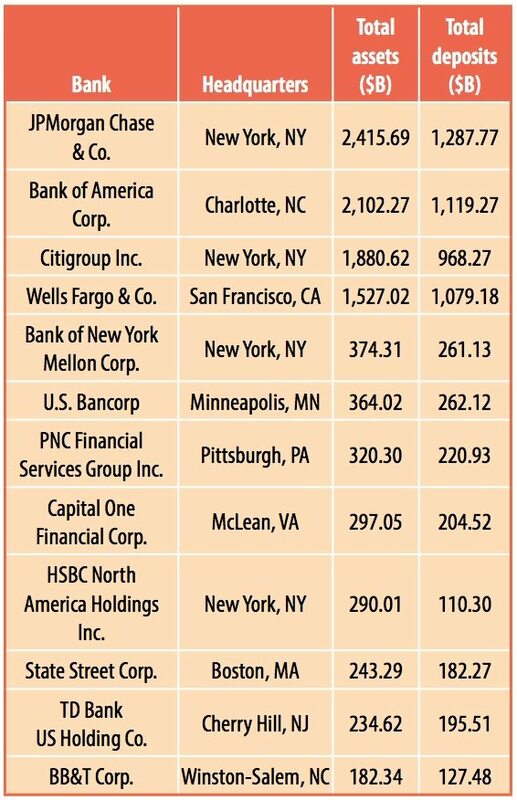 Zuhaib Gull, “Top 50 US banks in Q4’13,” SNL Data Dispatch, February 27, 2014. This review also excludes entities identified as 4947(a)(1) Non-Exempt Charitable Trusts. As defined by the IRS, “In general, a private operating foundation is a private foundation that devotes most of its resources to the active conduct of its exempt activities. [It] may qualify for treatment as a private operating foundation. 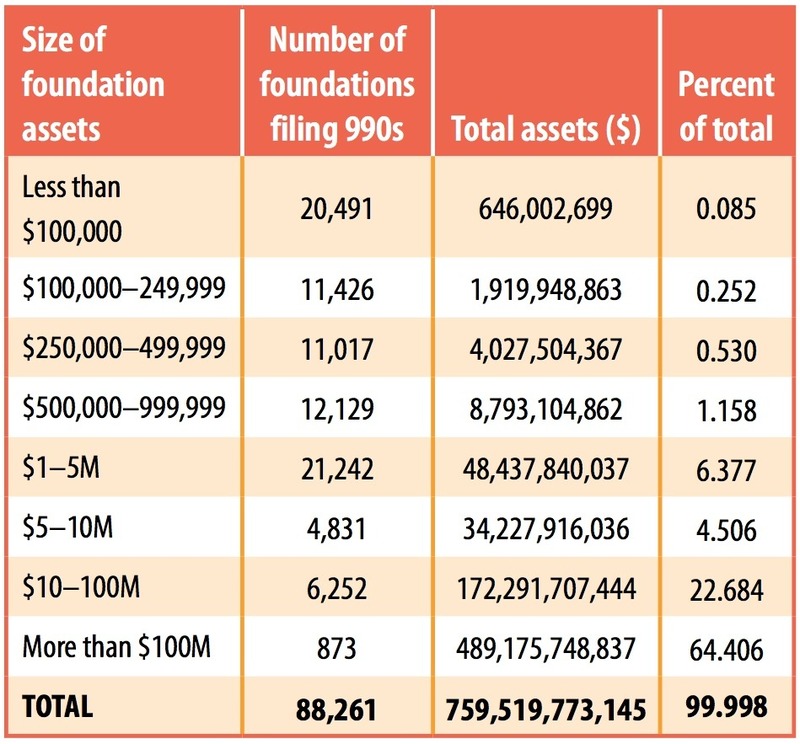 These foundations generally are still subject to the tax on net investment income and to the other requirements and restrictions that generally apply to private foundation activity. 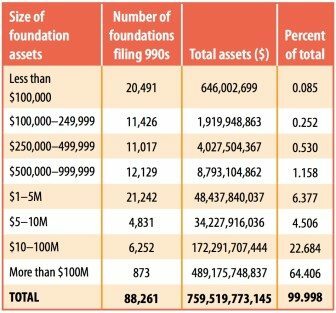 However, operating foundations are not subject to the excise tax on failure to distribute income.” In other words, unlike nonoperating foundations—which are foundations that do not “operate” programs—operating foundations don’t have a payout requirement. National Center for Charitable Statistics, Urban Institute. “2014 Contributions—Strengthening NYC,” Booth Ferris Foundation. “Summary of Foundation Grants,” William G. and Marie Selby Foundation. Standish H. Smith, “Reinventing The Corporate Administration of Personal Trusts—A Marketing Opportunity For Banks” (presentation to the Financial Analysts of Philadelphia, The Racquet Club of Philadelphia; April 20, 2000). 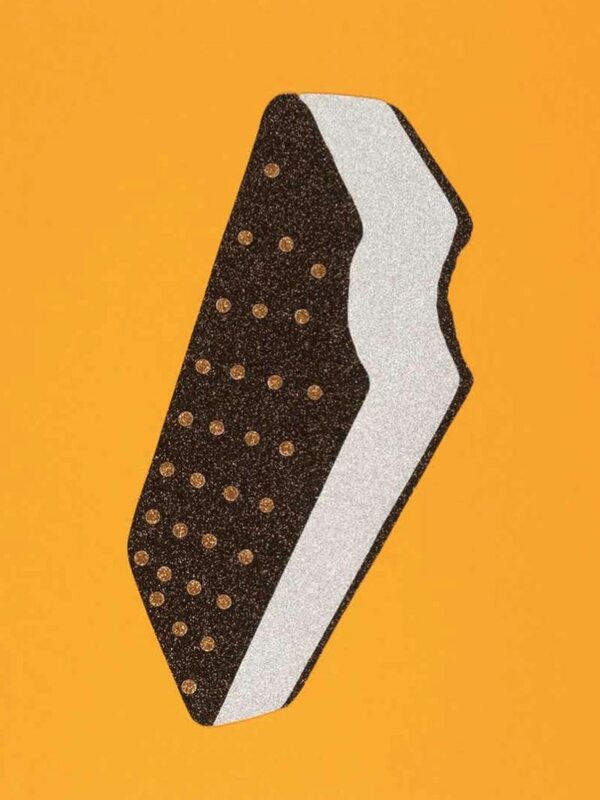 Brad Wolverton, “Loss of Trust,” Chronicle of Philanthropy, April 14, 2005. Patricia Horn, “Court blocks unilateral hike in trustee’s fees: Wachovia Corp. barred from raising trust fees,” Philadelphia Inquirer, April 29, 2005. W. W. Smith Charitable Trust v. Wachovia Corporation, J. E04001/04 (Pa.Super. 2005). Becky Sherblom, Banking on Philanthropy. Impact of Bank Mergers on Charitable Giving, (Washington, D.C.: National Committee for Responsive Philanthropy, June 2007). An annual competition identifies nonprofits that have found that sweet spot combining cost-cutting with real expansion of reach and impact.